It is possible to embed materials from Facebook into a content item or announcement that you add to your Blackboard course. Note that this method may stop working if Facebook change the way their service works. Facebook is a third party web site and iSolutions cannot be held responsible for the content held on it. iSolutions does not support Facebook. Users should read the Facebook terms and conditions. 2. 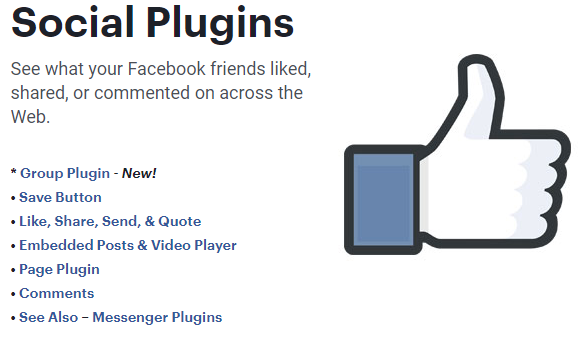 Choose the type of plugin you wish to use, for this example we will use the page plugin. 4. 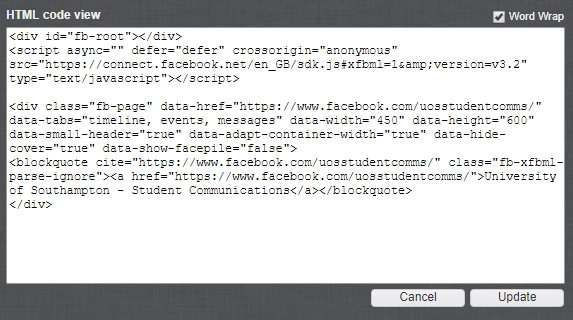 Enter the URL of the Facebook page you wish to embed and set the other options according to your preference. 5. 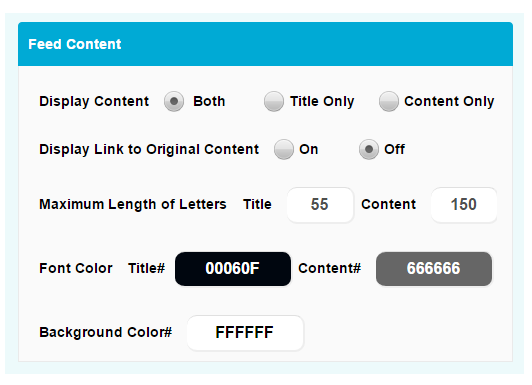 There is an explanation of the settings and what the default, minimum and maximum values are on the same page, a screenshot of which is below. 6. When you are happy with the settings, click on Get Code. 7. Two code snippets are shown you will need both. 10. Click on the HTML button within the text box to open HTML mode. 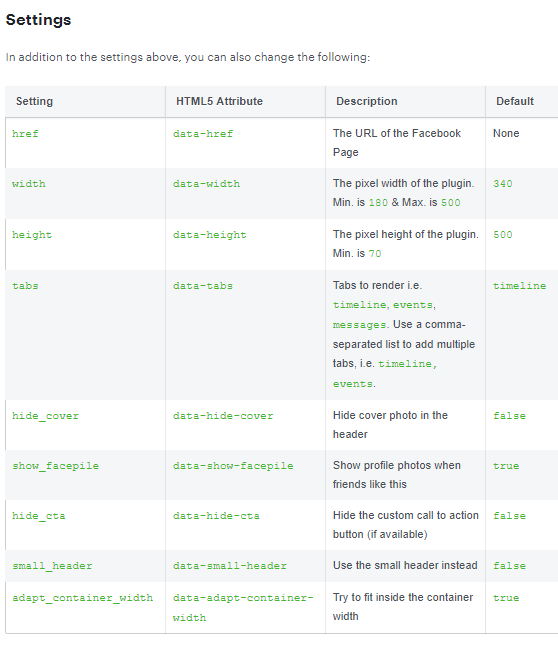 This will allow you to enter the HTML code required to embed the Facebook feed. 11. 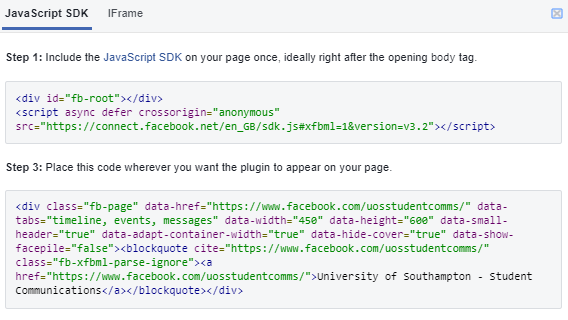 Paste both code snippets from Facebook into the HTML text box. One way to do this is to right click within the text box and choose paste or press CTRL + V. Click on Update to finish. This example uses most of the default settings. This example has the timeline, events, and messages for tabs, a width of 450, a height of 600, uses the Small Header, hides the Cover Photo, and does not show friend’s faces. If you have video or audio clips which you wish to add to Blackboard that are below 100MB in size you may follow the steps below to upload those clips so that they play within an HTML5 compatible framework. This will provide the highest level of compatibility with modern web browsers and devices. 1. 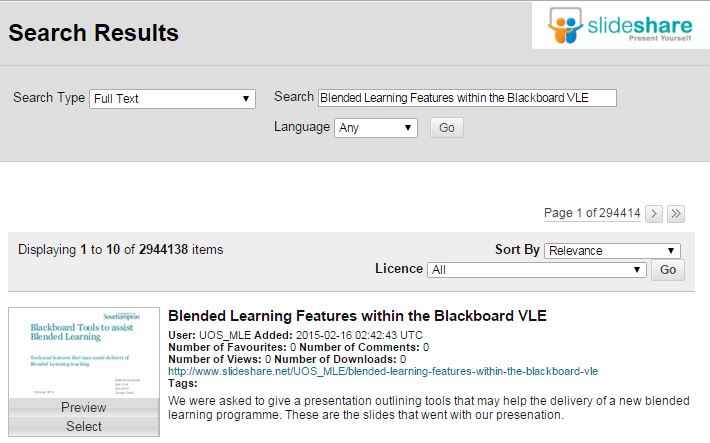 From within your Blackboard course, with Edit Mode enabled, hover over build content and choose item. 2. 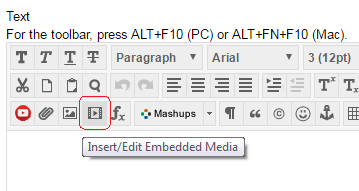 In the text box, click on the Insert/Edit Embedded Media icon. 4. 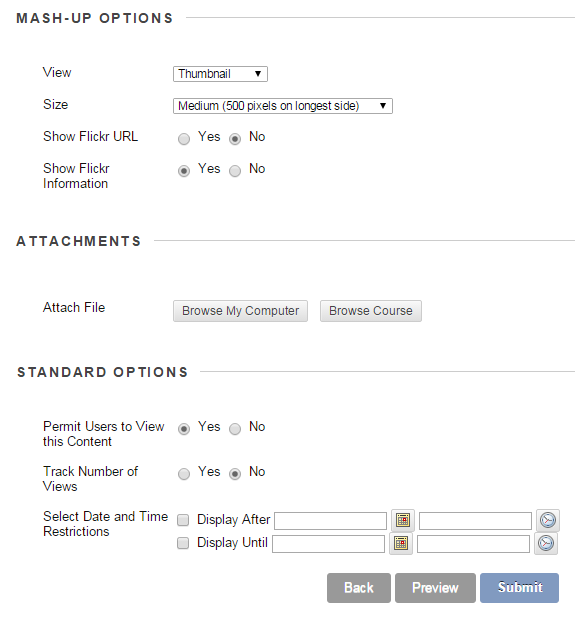 Click on Browse My Computer to upload a file from your computer, or Browse Content Collection to select a file that is already within your Blackboard course. 5. Blackboard will always assume you wish the video to be displayed in a window 320 pixels by 240. You may wish to change this to the dimensions of your video. 6. Click on Insert. Complete the rest of the text box if you wish. 7. 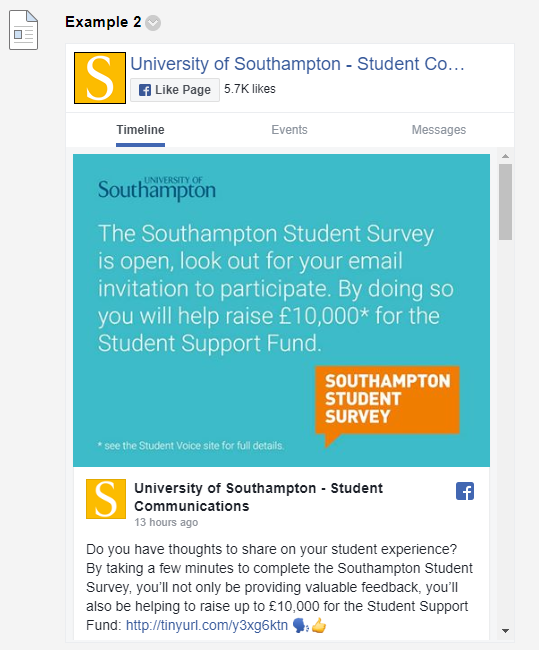 If you wish to allow students to download the video you should also add it as an attachment. This will help students whose browsers do not support HTML5, for example in institutions or environments where they are forced to use out of date web browsers. 8. 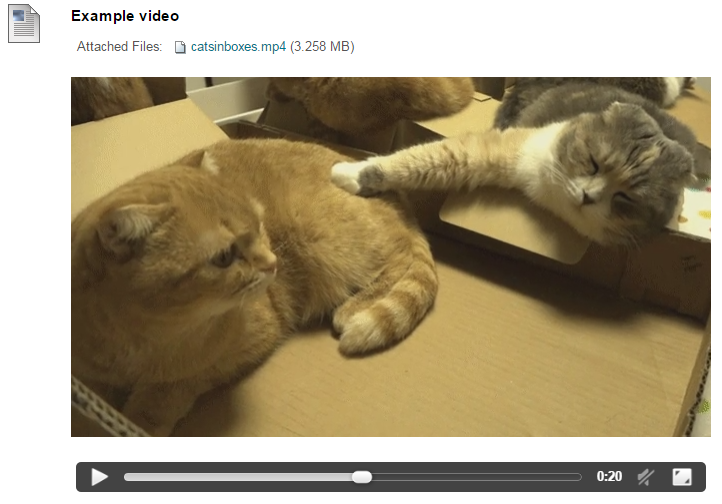 Here is an example of how an HTML 5 video looks, along with having the file available as an attachment. And here is how an HTML 5 audio looks. 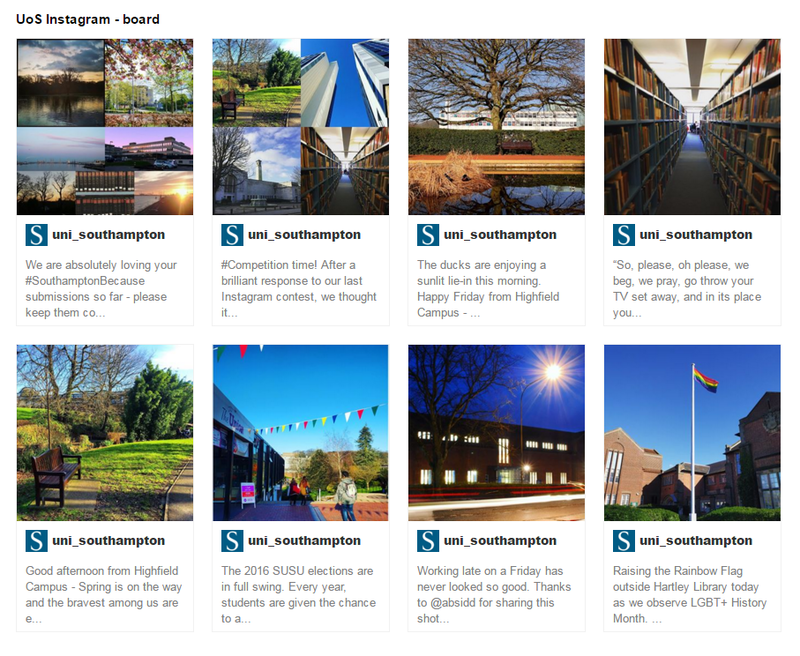 It is possible to use SnapWidget, a free third party service, to create an embed code to add your instagram photos into your Blackboard course. SnapWidget and Instagram are a third party services that are not provided via the University. Users should read SnapWidget’s and Instagram’s terms and conditions. Note Instagram have changed their rules and regulations. 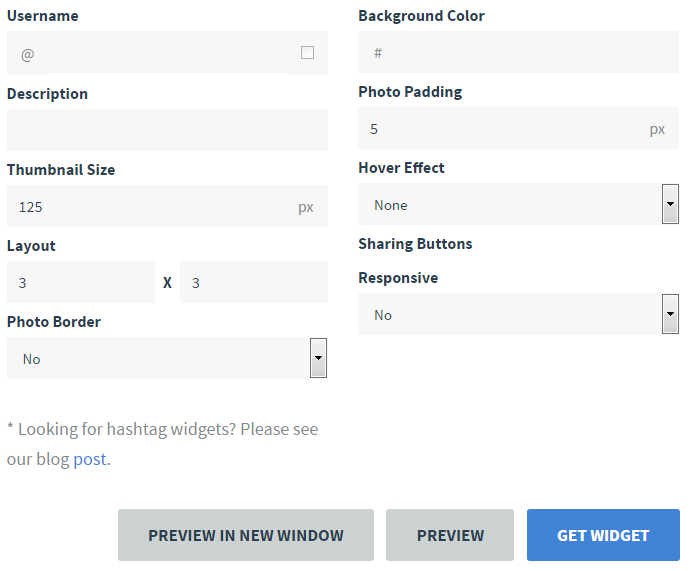 You may now only make widgets of your own content, not that created by other users of Instagram. 2. Enter the your username. 3. Choose the widget type you wish to use, here are some examples of how the different widgets look in Blackboard. 4. 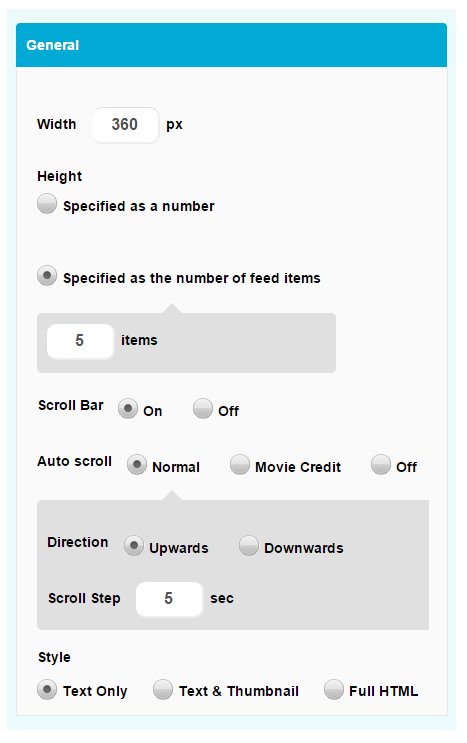 Set the other options according to your preference and click on Get Widget. 5. Select the text displayed in the box as shown and copy it to the clipboard either by right clicking and choosing Copy, or by pressing CTRL+C. Take note of the advice about changing http to https as we will need to make this change when we paste the snippet into Blackboard. 7. Identify where in your Blackboard course you would like to place the feed, and add the item, announcement etc. 8. Set a Name, and any relevant text in the text box. 9. Click on the HTML button within the text box to open HTML mode. 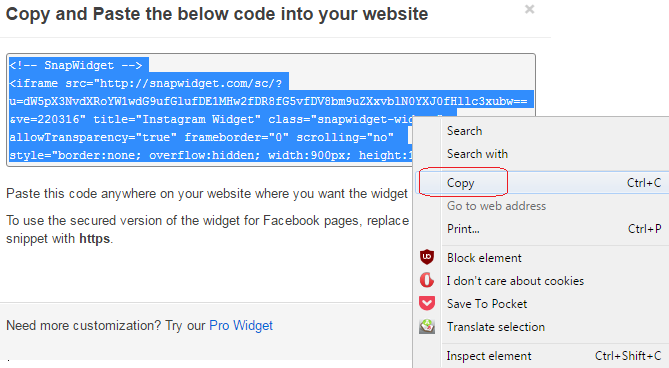 This will allow you to enter the HTML code required to embed the instagram feed. 10. Paste the text you copied into the clipboard from SnapWidget into the Blackboard text box. One way to do this is to right click within the text box and choose paste or press CTRL + V.
11. Change the http text to https. 12. Click on Update to close the HTML box, and then on Submit to finish. Thanks to the Instructional Support & Training team (also known as the iTeam) at the University of San Diego for the tip of using this method. 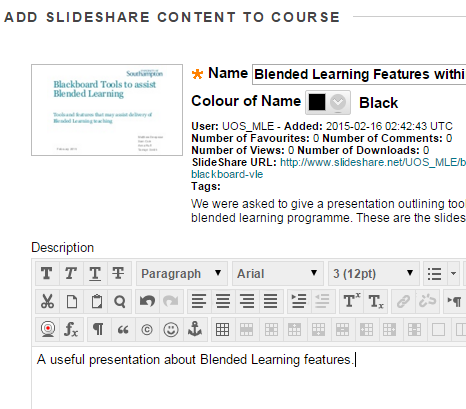 It is possible to add a SlideShare ‘mashup’ to your Blackboard course. Note that this feature may stop working if SlideShare change the way their content works. SlideShare is a third party web site and iSolutions cannot be held responsible for the content held on it. Users should read the SlideShare terms and conditions. 2. 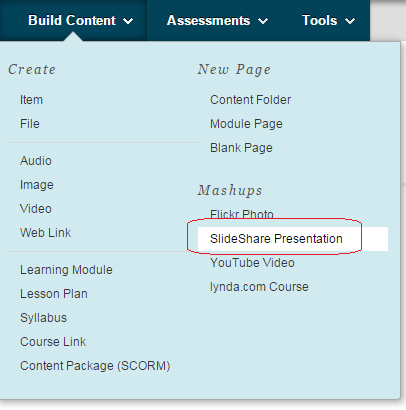 Choose the Content Area to which you wish to add your SlideShare presentation. All the content areas work in the same way, if you have renamed or added content areas to your Blackboard course the screenshot above may vary from what you see. 3. Hover your mouse over Build Content and then click on SlideShare Presentation. 4. Enter your search term and click on Go. 5. You should see a list of search results. Underneath the thumbnail of each SlideShare presentation there is a Preview button and a Select button. If you wish to see a larger preview of a presentation, click on Preview. Otherwise click on Select. 6. You may choose to change the display name for the presentation as it will appear in your course. 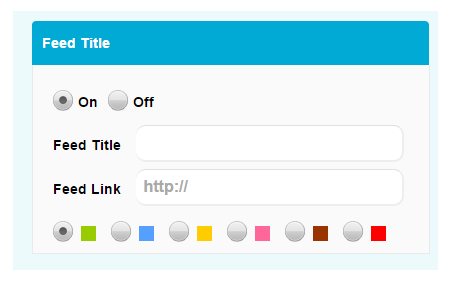 You can also choose the colour of the name, and add a description of the presentation if you wish. 7. Choose your preferred view for the SlideShare presentation when it appears in your course. You can choose to display a Thumbnail of the presentation (which can be clicked on to view the presentation), a Text Link with Player (which provides a text link which can be clicked on to play the presentation), or you can Embed the presentation within the page. You can always choose to preview each of these settings by clicking on Preview at the top or bottom of the page. 9. If you want to you can attach a file to this content as well (for instance if you have a word document which accompanies the SlideShare presentation). You can add a file from your computer by clicking on Browse My Computer. This is optional. Select Yes to indicate that the system is to track the number of times a user accesses this item. Select No to indicate that the number of times this page is accessed will not be tracked. Only use this option when you particularly require tracking information. A general report on Course Statistics provides tracking information for the whole course and is available from the Control Panel. 11. Click on Submit. 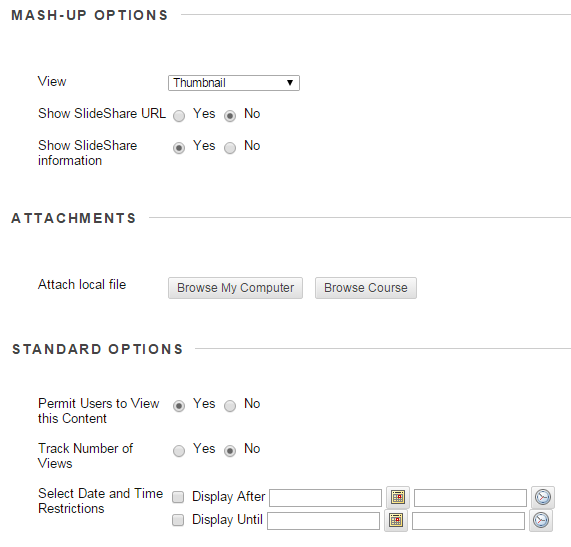 You can preview how your SlideShare mashup will look by clicking on Preview. LinkedIn Learning is a library of high-quality video tutorials on a wide range of software and business topics. 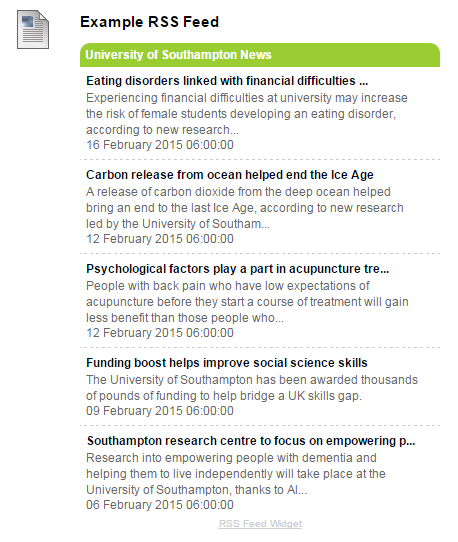 For more information about the LinkedIn Learning service at the University, please go to http://go.soton.ac.uk/lynda. To add LinkedIn Learning copy the link to the relevant learning materials to your browser clipboard, then follow this guide to add the link to your course. 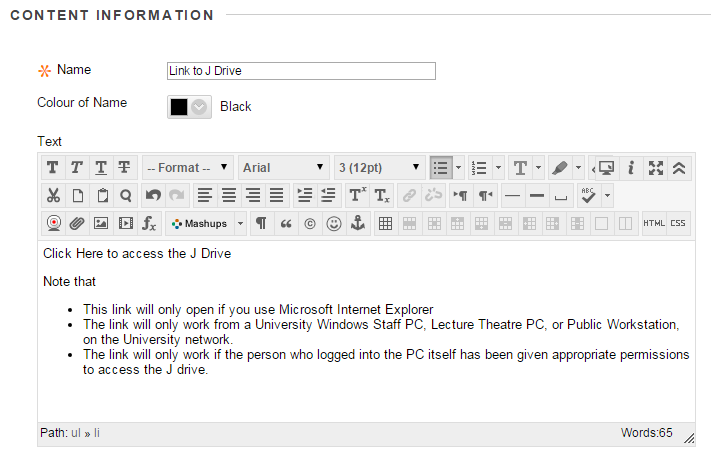 Adding a link to a J drive folder from your Blackboard course. 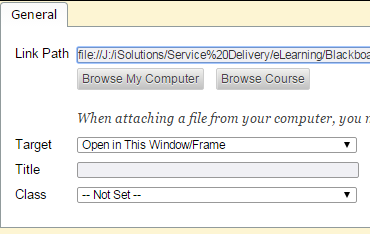 While not recommended it is possible to add a link to a folder or file on your J drive to your Blackboard course. – The link will only work on a Windows Staff PC, Bench PC or Public Workstation. 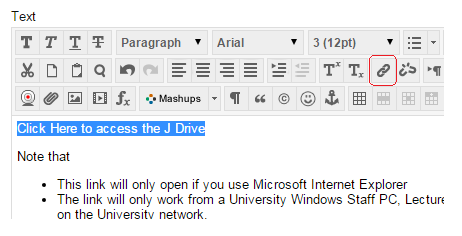 – The link will only work if the person who logged into the PC has access to the J drive folder/file in question. – There may be other support issues that we are unaware of and as such this method should not be relied upon. 1. First identify the J drive folder or file to which you wish to make a link. In this example a folder called “temp2” is being used. 2. Click into the Path box so that the text J: etc. is displayed, select all the text, and copy it to the clipboard. 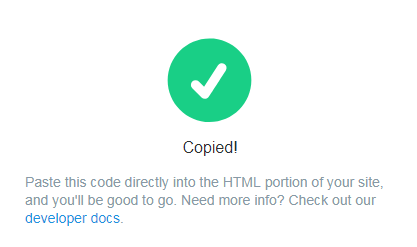 You can do this by right clicking on the highlighted text and choosing copy. Note that all of the text must be copied or the link will not work. Ensure that you have copied the entire path. 3. Now go to the place in Blackboard to which you would like to add the link. Start by adding an Item. 4. Enter a Name and colour as usual. In the text box type in the text that will be used to form the link, e.g. “click here to access the J drive”. 5. Select the text that forms the link you will make. 6. Click on the Insert Hyperlink icon. It looks like a globe and is highlighted in red in this screenshot. 7. A new window will pop up. 8. In the type dropdown box choose File. 10. Paste in the path you copied to the clipboard earlier so that it is appended to the file:/// text. 11. Change all the backward slashes from the text that you pasted to forward slashes. 14. 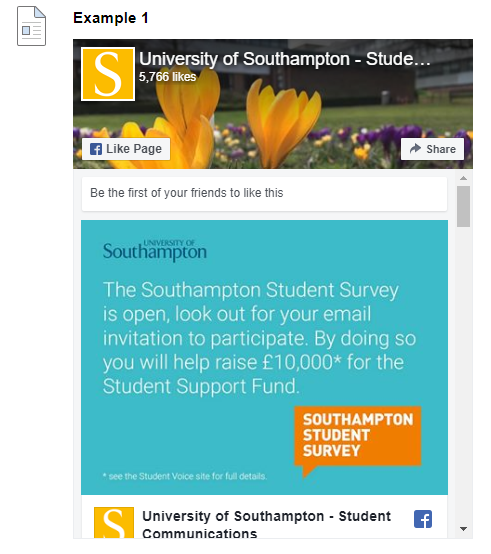 The text you selected before will now be underlined showing that it is a link, click on Submit to finish. 15. Your link has now been created. Test it by clicking on it. 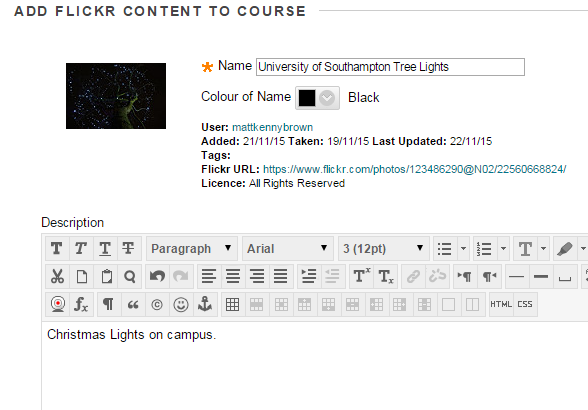 Adding a Flickr photo to your Blackboard course. 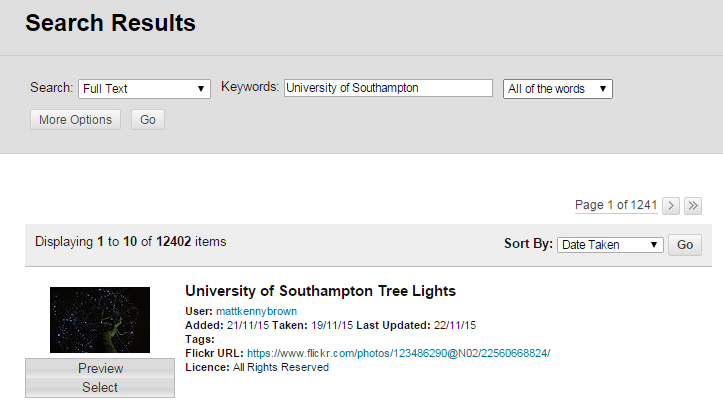 It is now possible to add a Flickr ‘mashup’ to your Blackboard course. Flickr is a third party web site and iSolutions cannot be held responsible for the content held on it. Users should read the Flickr terms and conditions. 2. Choose the Content Area to which you wish to add your Flickr photo. All the content areas work in the same way, if you have renamed or added content areas to your Blackboard course the screenshot above may vary from what you see. 3. Hover your mouse over Build Content and then click on Flickr Photo. 4. Enter your search keywords and click on Go. Note you can also choose to do an advanced search by clicking on More Options. 5. You should see a list of search results. Underneath the thumbnail of each photo there is a Preview and Select button. If you wish to see a larger preview of the photo you wish to use, click on Preview. Otherwise click on Select. 6. You may choose to change the display name for the photo as it will appear in your course. You can also choose the colour of the name, and add a description of the photo if you wish. 7. 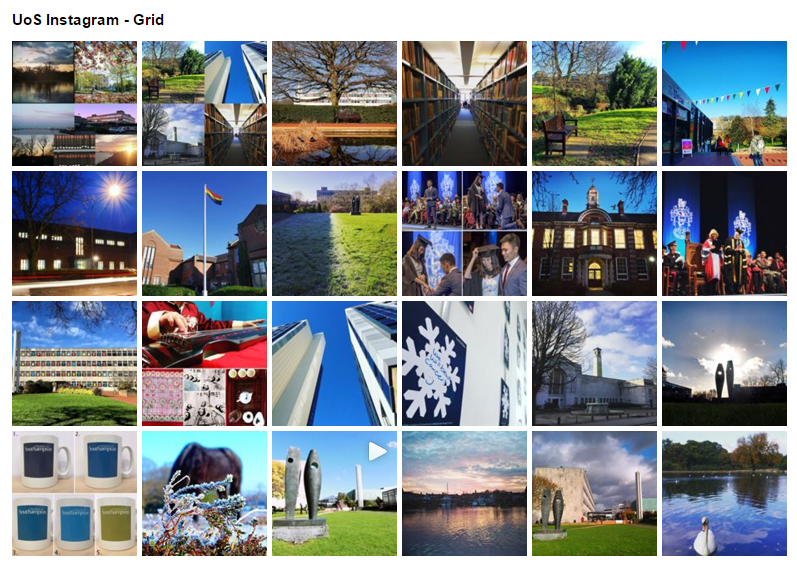 Choose your preferred view for the Flickr photo when it appears in your course. 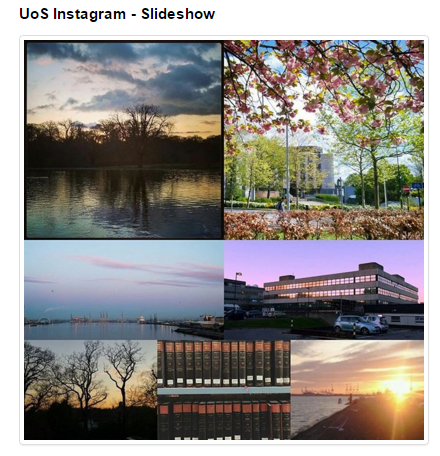 You can either choose to display a Thumbnail of the photo (which can be clicked on) or you can choose to Embed the photo. Note that Thumbnails will show as full sized when View Link is clicked. 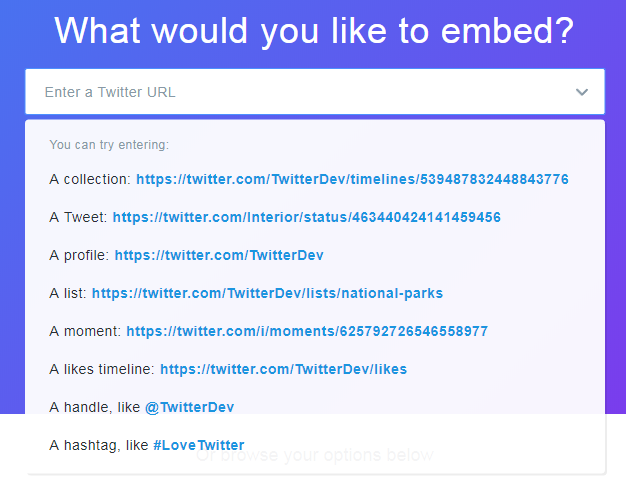 Embed Photo will show the photo directly on the page without the user having to click on a link. 8. Choose the size of the photo to display. Note that not all photo sizes will be available for all photos on Flickr, as this is dictated by the owner of the photo. 10. If you want to you can attach a file to this content as well (for instance if you have a word document which accompanies the photo). You can add a file from your computer by clicking on Browse My Computer. This is optional. Select Yes to indicate that the system is to track the number of times a user accesses this item. Select No to indicate that the number of times this page is accessed will not be tracked. Only use this option when you particularly require tracking information. A general report on Course Statistics provides tracking information for the whole course and is available from the Control Panel. For more information about this feature check the link on the right under “What’s Related”. 12. Click on Submit. You can preview how your Flickr photo will look by clicking on Preview. 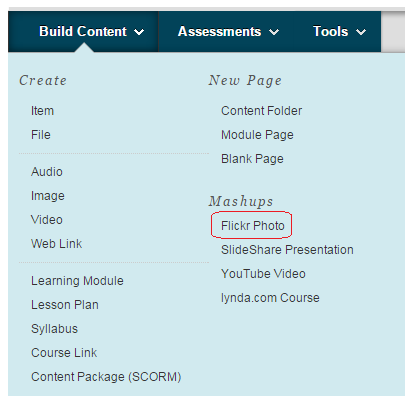 Using the HTML feature within Blackboard you may embed content from other websites. RSS feeds provide lists of news items that can be clicked through to access the originating content. 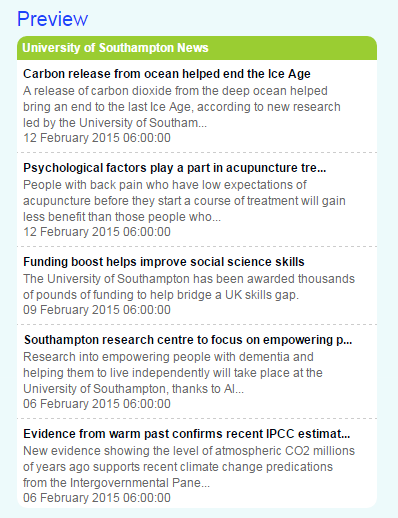 Using a RSS widget embedded into a Blackboard course allows you to embed news items from other websites. There are many RSS widgets available that offer embed codes. In this guide I use http://feed.mikle.com/ which is a third party service that may change without warning, please read the Terms of Service before following this guide. 1. In your web browser go to http://feed.mikle.com/. 2. Paste the RSS feed you wish to use into the Feed URL text box and click on Add Feed. 3. Set the general options according to your preference. The live preview will update to show you the impact of any changes. 4. Set the feed title options according to your preference. The default settings should be fine. 5. 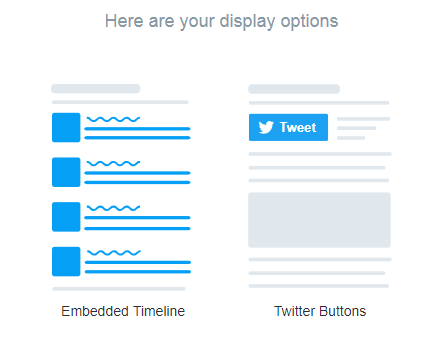 Set the feed content options according to your preference. Again the default settings should be fine. 6. Review the preview and check that it looks as expected. Adjust the previous options if you wish to change it. 7. Identify the box below the line Add this code to your webpage… and then click on “Click here for iFrame code”, a further box of code will be revealed. Click into that box. 8. All the text should be selected, right click on the selected text and choose Copy from the context menu that appears. 9. Now we will go to Blackboard. 10. Identify where in your Blackboard course you would like to place the feed, add the item, announcement etc. Add the item desired. 11. Set a Name, and any relevant text in the text box. 12. Click on the HTML button to open HTML mode. 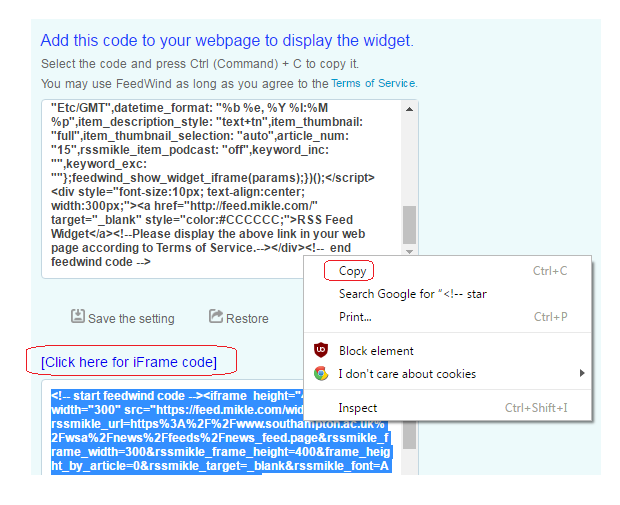 A new windows will appear allowing you to enter the HTML code required to embed the rss feed. 13. Paste the text you copied into the clipboard at step 8 above into the Blackboard text box. One way to do this is to right click within the text box and choose paste or press CTRL + V. Click on the Update button when you have finished. 14. Scroll to the bottom of the page and click on the Submit button. 15. Your RSS feed is embedded within your Blackboard course.